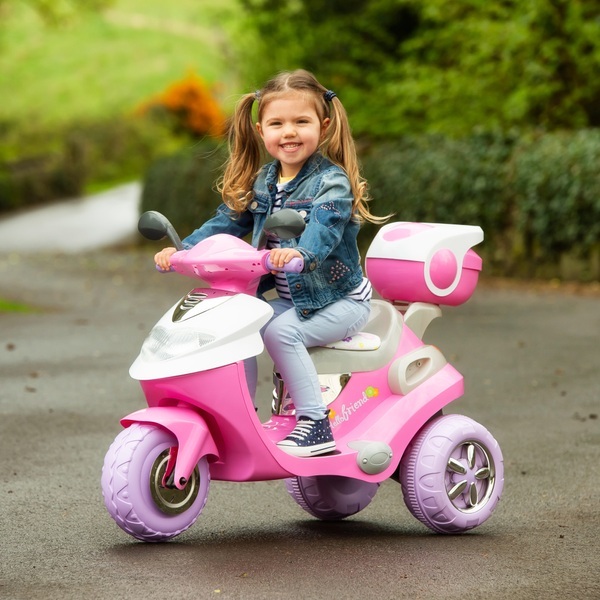 Scoot off in style with the Pink Electric Scooter 6V Ride On. This sweet electric scooter is perfect for kids with an eye for fashion and a passion for fun. Simply press on the foot pedal to whizz forward and start your scooter adventures. Check your wing mirrors, reverse, and then toot the working horn for more role play fun. Wide footrests and textured handles help kids to stay balanced and keep a firm hold on the ride on as they play. The Pink Electric Scooter 6V Ride On features a comfortable padded seat with a pretty floral pattern that kids will love. There’s even a handy storage compartment on the back, so you can bring your favourite toys on the go. This colourful electric ride on runs at safe speeds of up to 2 mph to make sure kids stay in control as they play. The Pink Electric Scooter 6V Ride On fits in most cars, so it’s easy to take home this cute ride on. This electric ride on is suitable for kids from 3 years up to a maximum user weight of 35kg. EU Warning: Not suitable for children under 3 years. This product should, at all times, be used by the child under direct supervision of an adult. Should not be used on/or near public roads.